Order today and your delivery will also include FREE Head Cover and Battery! The VK-40 is Viking's newest and most advanced metal detector ever produced (which is quite a feat, considering they have been making excellent metal detectors in the UK since the "early days" of the 1970s). 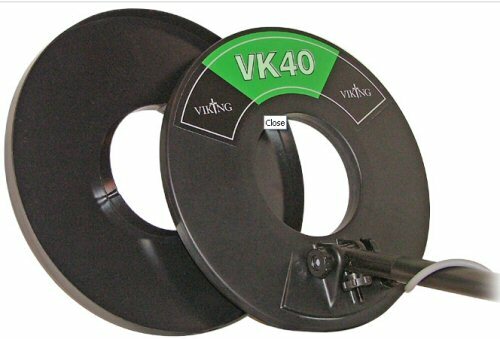 The VK40 has all the features of the classic VK30, with a some very useful extra features: While the VK-30 boasts 2 modes of operation (Motion, non-Motion), the VK-40 has a 3rd mode, called "All Metal Motion". This extra mode provides all the advantages of a motion detector (deeper ground penetration, better discrimination), with the useability of a non-Motion detector (variable analogue audio signal, all targets detected). The net effect is simplicity of operation - the audio tone itself gives a better indication of the target and, while every metal target yields a signal, you are provided with a visual indicator of the type of metal from which it is made. In addition, the new "polo"-shaped head is both lighter and more efficient, thereby achieving greater depth of detection. This is a great detector, which is at least as advanced as very many much more expensive models - and that is probably why Viking metal detectors continue to be widely seen in almost all the country's metal detector clubs. 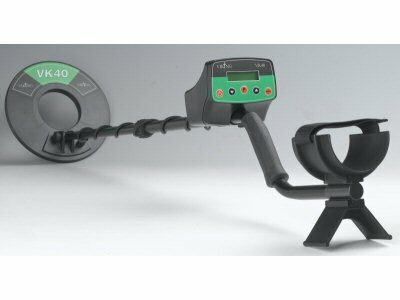 To both enthusiastic newcomers and experienced detectorists, we recommend this excellent detector. Specialising in good quality lower-priced detectors, Viking have, over the last 20 years, earned a reputation for reliability, effectiveness and value for money. Viking detectors are not only sold to treasure hunters right across Europe, but also to water authorities, local councils and many other service industries. What's more, all our Viking metal detectors come with a 2-Year guarantee against any manufacturing defects.